Asus presented in the Computex in Taipei a project they've been working on together with Intel, the EeePC is powered by a Intel mobile processor, has 512 MB of DDR2-400 memory and comes with a choice of between 4 and 16 Gb flash drives. 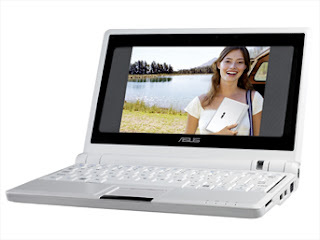 Asus plans to start producing the EeePC in August (and so do i), will be looking forward getting my hands on one. Of course this blog wouldn't be complete if i don't make a little tribute to what i consider to be the most special jewel in the Open Source crown. The Gimp (short form of 'GNU Image Manipulation Program') is a freely distributed piece of software for such tasks as photo retouching, image composition and image authoring. It works on many operating systems, in many languages. In the official GIMP web site you'll find information about downloading, installing, using, and enhancing this fantastic graphic suite. This site also serves as a distribution point for the latest releases. What? you're still reading this? go check it out!!!! Well, it's finally happening, ms realizes that Linux is a real competition and a possible threat to them on the desktop and is now throwing it's tentacles around and trying to get a hold on it... just shortly after saying that Linux was violating some of their patents, now they're willing to happily "work" together with some of those companies? Funny i'd say, i used to be a SuSE user, but after novell threw herself to ms feet they lost my respect, i can do on Linux everything i can do on windows (and sometimes even better) and i'm no Linux guru... heck i can barely write a shell script!! if something doesn't work "out of the box" i still make it work, even if it takes sometime reading in a forum or asking Google. Fact is that most PC users just want things to work, and ms does a great job at that (which to me translates into treating you like a braindead moron), insert the cd and watch the light blink. I won't say that novell/xandros/linspire and whoever else is throwing himself to ms feet is doing a bad move, i just truly hope that in a future our Linux stays pure, open and free. 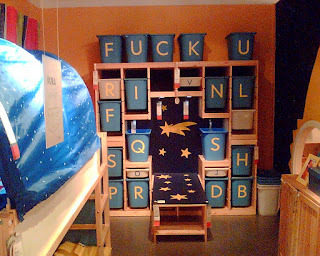 As we were shopping in Ikea, we pass by the children bedroom section and stumbled across this view... i guess some rebel teenager was messing around here already and made it clear that he doesn't like the decoration. Good new for web designers. Now you don't have to mess around with virtual machines, emulators, etc in order to run internet explorer under Linux, the IEs4Linux script makes it possible to install almost automagically the popular MS browser. KDE 4 live for testing available. For those wanting to get their hands on the latest release of KDE, the developers have a live CD based on Open Suse10.3 ready for download and be tested. Note that this is an early unstable Alfa release and not suitable for end-user, so count with bugs and some applications like KControl don't work so well if not at all. The Dolphin file manager makes a good impression although is not completelly prepared for everyday use. For more information visit the KDE website.